Either weigh the vegetables, or measure them by volume, as indicated. You can then easily increase the quantities - just keep the proportions the same. Cut all the vegetables into 1cm dice. 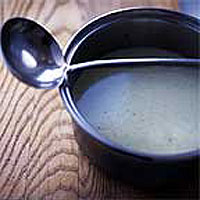 Melt the butter in a heavy-bottomed saucepan over a medium-low heat. When it foams, add the potatoes and onions. Season well, stir, then cover with a 'lid' made from baking parchment, putting the paper right on top of the vegetables. Cover the pan, turn the heat down low and sweat over a gentle heat for 10 minutes. Add the chopped vegetables and stock. Bring to the boil, reduce the heat and simmer until the vegetables are soft enough to crush - up to 30 minutes. Liquidise, then push through a sieve if you like. Taste, adjust the seasoning and serve.